Driving north on Highway 99E as you enter Canby, it’s very hard not to notice the Vietnam memorial citizen of the small Willamette Valley town have constructed. 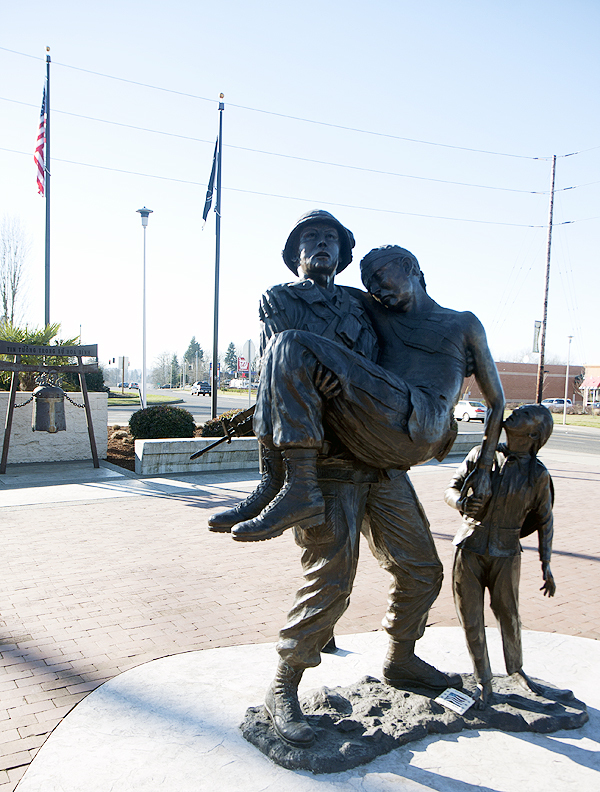 The small park, along Highway 99E at the south entrance of Canby, has been in place since about 2008 and is a reminder of the sacrifices and service of those who served in the military during the Vietnam era. The helicopter is a medevac which had the call sign of “dust off” in 1963. During the Vietnam War, wounded servicemen were airlifted to hospitals within an average of 35 minutes, saving thousands of lives. The memorial, which was started in 2000 took 11 years to complete, with the land, helicopter and other amenities at the park being either donated or purchased through years of fundraising. Most people who live in or around Canby during that time pitched in to make the memorial a reality, and in 2011 it was finished. It was a community effort, with local businesses, government agencies and the local newspaper being heavily involved in making it a reality. The memorial is also a Blue Star Memorial, marking it as one of the thousands around the United States, as a tribute to the Armed Forces that have defended the U.S. These memorials were started by the garden clubs and there are several in Oregon. Mike Breshears, a veteran who is the driving force behind the memorial, said in media reports that he wanted it to be a place of healing, solace and to remember the men and women who served their country in all of the different wars. The plants surrounding the memorial also harken back to Vietnam, with bamboo, pine, palm, and other plant materials that can be found in that country growing along the memorial. “A Hero’s Prayer” was the last piece of the memorial to be finished, and it’s a bronze statue which depicts PFC Gary W. Martini, USMC, Oregon Medal of Honor recipient who was killed in action in Vietnam, with a Vietnamese child by his side. The figure Martini is carrying is U.S. Army Spec-4 Warren E. Newton, a Canby soldier listed as missing in action in Vietnam. The statue was created by Pennsylvania sculptor Wayne Hyde. When you stand at the park it looks like subjects in the statue are moving toward a red cross, where the helicopter will land. It’s a very powerful image if you take the time and really look at it and think about the war. About Canby’s Vietnam Memorial: A triangle park near the south entrance of Canby that features a memorial to the Vietnam War. It has a full-sized Huey helicopter on a pedestal and a bronze statute featuring two Oregon soldiers. What to bring: The entire memorial is outdoors, so make sure you dress for the weather. Tip: Take the time to listen to the call-in narration and look at each of the elements of the memorial. It’s a beautiful park and an excellent tribute to our U.S. veterans. Season: The park is open year-round. Getting there: The park is located on Highway 99E near 421 SW Fourth Avenue.